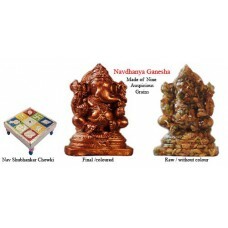 This unique divine duo- The Navdhanya Ganesha and the Nav shubhankar chowki/seat-is a de.. This unique divine duo- The Navdhanya Ganesha and the Nav shubhankar chowki/seat-is a devotional masterpiece. This chaturbhuja (four arms), Vighan vinashak (obstacle remover) Ganesha Idol which is made of Nav-dhanya (nine auspicious grains), is available. The significance of these Nine Auspicious Grains for their spiritual, astrological, materialistic/worldly and positive energy related benefits are very well mentioned in many ancient Indian scriptures like Padampurana etc. It is believed that Chaturbhuj (4 arms) Lord Ganesha counters/ vaastu doshas (architectural faults). The Nav shubhankar chowki, consisting 9 auspicious symbols, is considered very auspicious to place God / Goddesses statues, Pooja Thali, Kalash etc.It can be placed anywhere- temple, home, car, office or factory. This kind of devotional masterpiece is rare in Meenakari craftsmanship. Adorn your pooja room or workplace with this majestically sitting Ganesha, a perfect choice for gifting to your near dear ones. Spiritual Aspect: The etymology of the word –Dhanya (Grains) which means prosperity, itself reveals its importance. In ''Padma-purna'' the significance of these nine grains are well elaborated and these grains are equated with, due to their infinite positive energy/strength and power, Lord Brahma (germinator), Lord Vishnu (the preservator) & Goddess Laxmi (the consort of lord Vishnu and goddess of wealth/prosperity). Astrological Significance: Astrologically, It is believed that everything in the Universe is influenced and governed by Navgraha (Nine Planets), whether it is a plant, tree, animal or a human being. Our seer/sages (Rishi/Muni) who were blessed with the divine vision, could see, identify and systematically analyze the integral relationship and impact of cosmic energy in general & of nine planets in particular on Human beings. As they were devoted for the overall wellbeing of the human being, out of their divine, scientific and systematic wisdom, they identified few selected items available on earth as one of the best receptors and transponders of the positive cosmic energy emitted by the Nav-grahas (nine planets). In this regard they ranked on top the NINE AUSPICIOUS GRAINS, highly capable to not only countering the negative effects/nav-graha doshas of nine planets on human being but to bless them with their positive energy also. Their wisdom full use definitely blesses one’s life with both spiritual ecstasy and worldly success. Worldly & Ritualistic Significance: Due to their well proven auspiciousness, these nine grains are considered as an inevitable component of almost all Karm-Kandas (rituals) related to god/goddess’s and nine planets (nav-graha) to remove the obstacles and bless one’s life with health, wealth, peace & prosperity. In all rituals, whether related to birth, marriage, business/work or any other aspect of human life, in almost all cultures and civilizations one or the other of these nine grains are used as an integral component. In conclusion, because of their intrinsic positive qualities, these grains are considered as one of the richest receptors of cosmic energy in general and of nav-grahas (Nine planets) in particular. And, treated as the harbinger of peace and prosperity.